Join me for a meditation like none other. We’ll start with some gentle movement on the ground to relax the tensions of your day and find prana moving through your body. Then we’ll move into the cocoon of our single-point hammocks, being wrapped completely in the silks. As you withdraw the senses, you’ll be led through a guided meditation inspired by the Gheranda Samhita. Become immersed in your own being, discovering the visions and sounds that live in your mind before letting them drop away and revealing the inner spirit that lives inside of you, your own inner Om Fairy. Save $5 per person when you sign up with a friend! Use code “flightfriends” at check out when reserving 2 spots. Proper alignment is something we strive for in a yoga class, but with the variations in our bodies, the general alignment cues often miss the mark. The curvature of our bones, the placement of our joint sockets, how our bodies have moved over the years, the adaptation of our fascia, and the atrophy and/or overuse of our muscles all contribute to how we find the alignment unique to us in a yoga posture. We are all different, and what works for one person might not work for the other when it comes to alignment cues. In this series we will look at the essence of yoga postures, diving into the purpose of the pose and teasing out what parts of our body contribute to the overall achievement of it. While each class will look at the anatomy of the body and what muscles we are attempting to activate and isolate, we’ll explore exercises that help you feel the sensations in your body, discovering the patterns unique to your body, and how to apply that information to common yoga postures. Each class in the series will focus on different components in the body, but remain accessible to all, so attend one in the series or attend them all! Whether you are in yoga class, running, weight lifting, or simply walking down the street, you’ll begin to notice how the principles covered in this series can be applied to your life… or your clients’ lives if you teach a movement modality. Dates for this Series: 3/10; 5/19; 7/14 – Attend one or all! 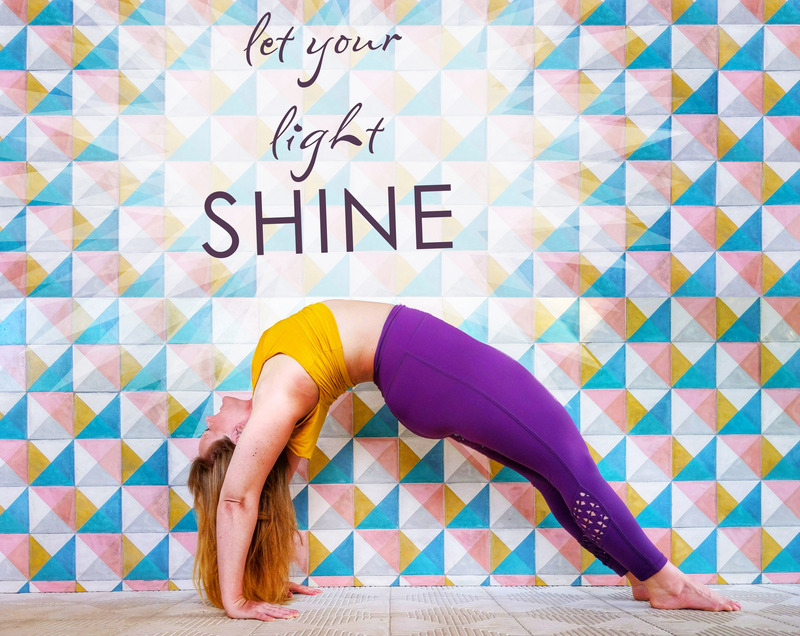 Backbends provide a sense lightness and openness, leaving you exuding joy as if a spark has been lit from inside, ready to shine bright to the entire world. 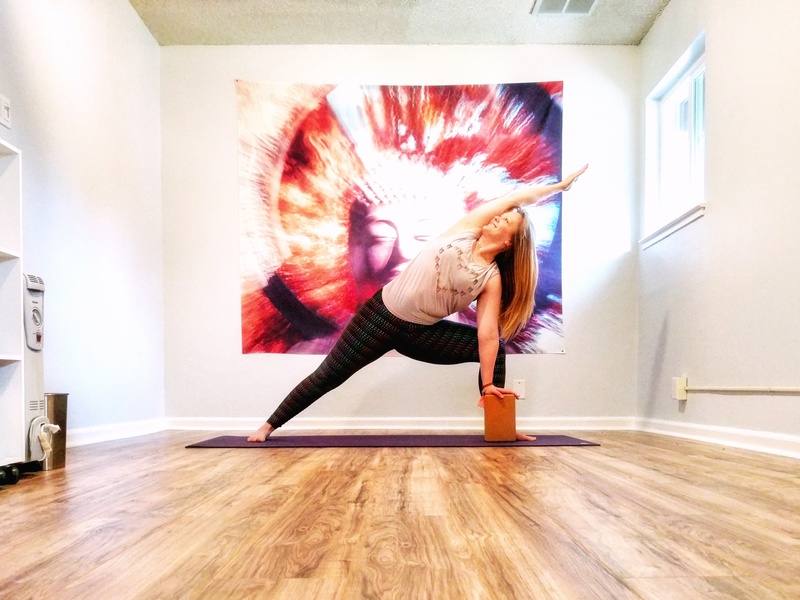 Join Courtney for this special 2-hour class where we’ll dive into warming flows that will allow us to fully prepare for some of the deeper backbends we don’t often get to in class. We will approach these postures with a balanced body and mind, ensuring that while our muscles are warm and the bodies strong, that we have also properly released and relaxed our muscles, ensuring fresh blood flow to the areas that will work hard to bring us into each asana. From exploring variations of anjaneyasana, bow, and wheel to diving into scorpion, thunderbolt, and kapotasana, we will work with the minute movements that make a big difference in how these postures feel in your body. Get ready to let your light shine! Save $10 per person when you sign up with a friend! Use code “friendsshinebright” at check out when reserving 2 spots. Inversions are interesting postures that have the ability to both provide a sense of calm and invigorate you at the same time. In this series we’ll explore some of the key components to help you build a strong, steady inversion practice. Over the course of these 4 weeks we will explore bandhas, breathwork, drills, flows, and props that can help you grow your inversion practice, whether you’re looking to work on your stamina in shoulderstand or your float into headstand. We’ll be exploring shoulderstand, headstand, forearmstand, and chinstand in this series. Each week you will leave class with the online video companion to this series. These videos will allow you to continue your practice until the next session, so you know what to work on and you see your progress grow each week. You’ll leave this workshop with the tools to enter into inversions safely, explore the sensation of being upside down for longer periods, and build into variations on the inversions you gain comfort with. Save $15 per person when you sign up with a friend! Use code “friendsflip” at check out when reserving 2 spots. Want to be the first to learn about new workshops? 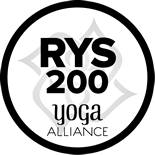 Sign up for the Om Fairy newsletter so you will stay in the know. 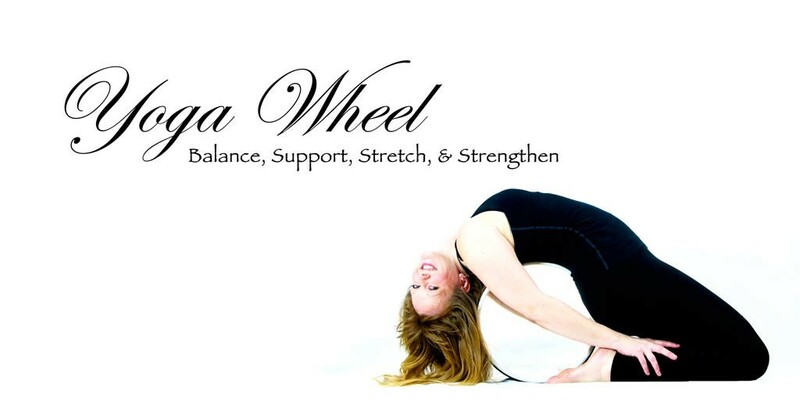 Discover how the yoga wheel can provide support, strength, and even challenge in your yoga practice! 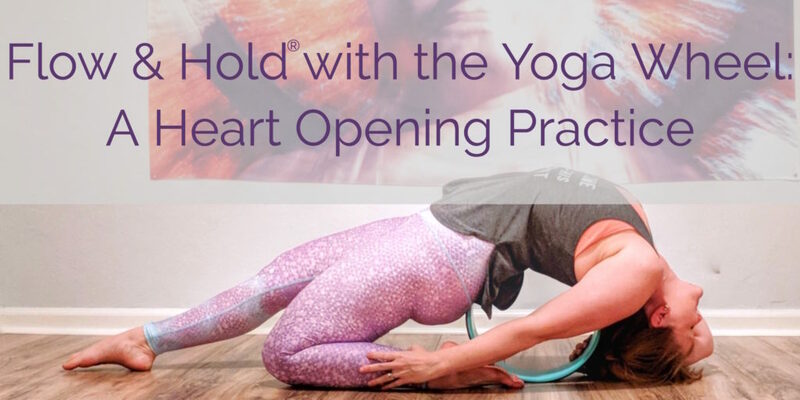 In this heart-centered class with instructor Courtney Krishnamurthy, we will flow with the wheel, warming the body and preparing you to explore backbending postures. We’ll then discover how the yoga wheel can help us work deeper into our asanas as we hold the postures a little bit longer. From finding additional support with the wheel to deepening our experience of the body moving further into asanas, we’ll learn how the wheel can help us move through a heart-opening practice. Have you always wanted to try aerial yoga, but you feel overwhelmed at the idea of jumping into a Flying Lotus™ class? Join us in this Aerial Basics workshop. 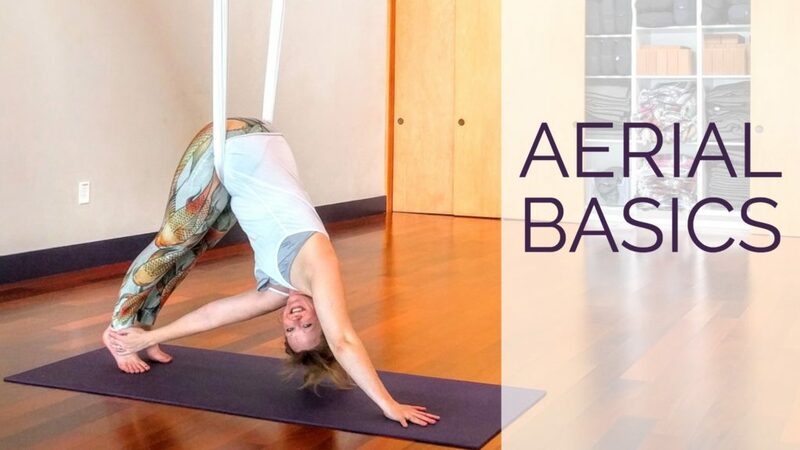 We’ve designed this workshop to familiarize you with the building blocks of an aerial yoga class. In this workshop you’ll learn how to stay safe in the hammock, how the hammock moves with you, and the basic moves that you’ll encounter in most aerial yoga classes. 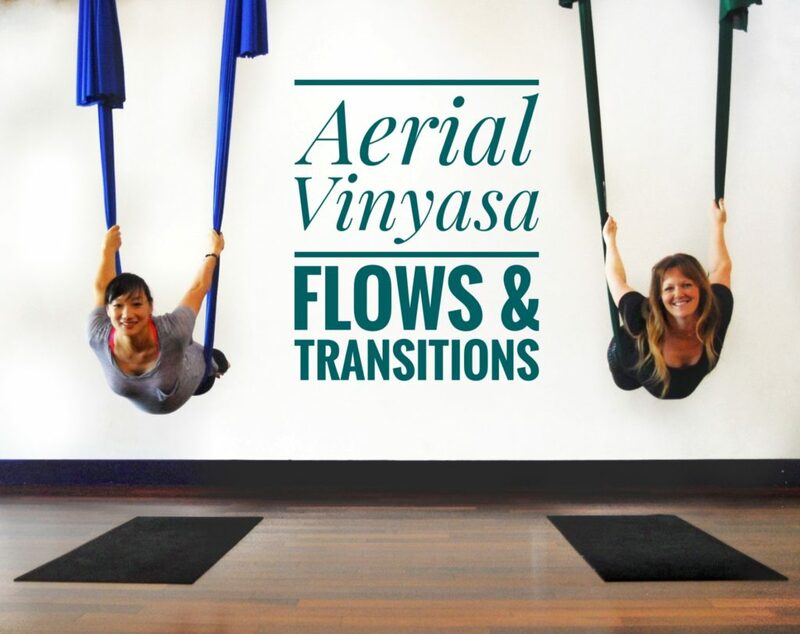 As we move from reclining poses to seated poses to our Flying Lotus vinyasa sequence you’ll gain the confidence and experience to feel comfortable in any aerial yoga class. As we work our way towards savasana, you’ll wonder what kept you from trying aerial yoga sooner. 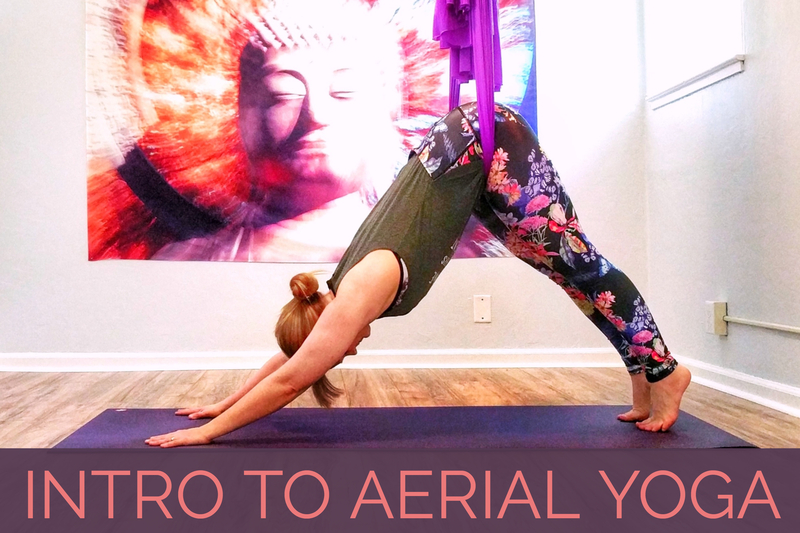 Have you always wanted to try aerial yoga, but you feel overwhelmed at the idea of jumping into a regular class? 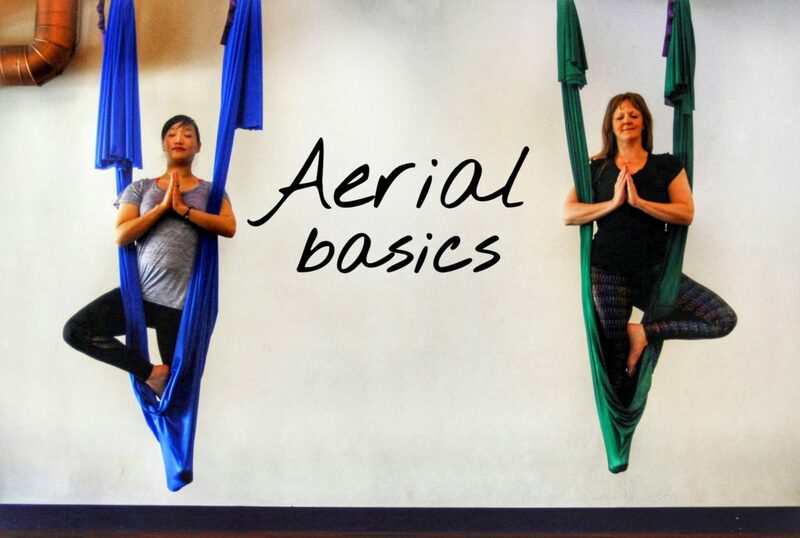 That’s exactly why I’ve designed this Intro to Aerial Yoga series which familiarizes you with the building blocks of an aerial yoga class! This series consists of 4 weekly classes where each week we will experience something new in the hammock and build on our previous week’s knowledge. In week 1 we’ll start with Low Series Gentle Yoga where the hammock is only a foot off the ground, and we’ll learn foundational postures that will aid you in the coming weeks as we take the hammock higher. You’ll learn how to stay safe in the hammock, how the hammock moves with you, and you’ll gain confidence in your abilities to join any aerial yoga class! Series limited to 2 people. Reservations required. Inversions are interesting postures that have the ability to both provide a sense of calm and invigorate you at the same time. In this series we'll explore some of the key components to help you build a strong, steady inversion practice. Over the course of these 8 weeks we will explore bandhas, breathwork, drills, flows, and props that can help you grow your inversion practice, whether you're looking to work on your stamina in shoulderstand or your float into handstand. 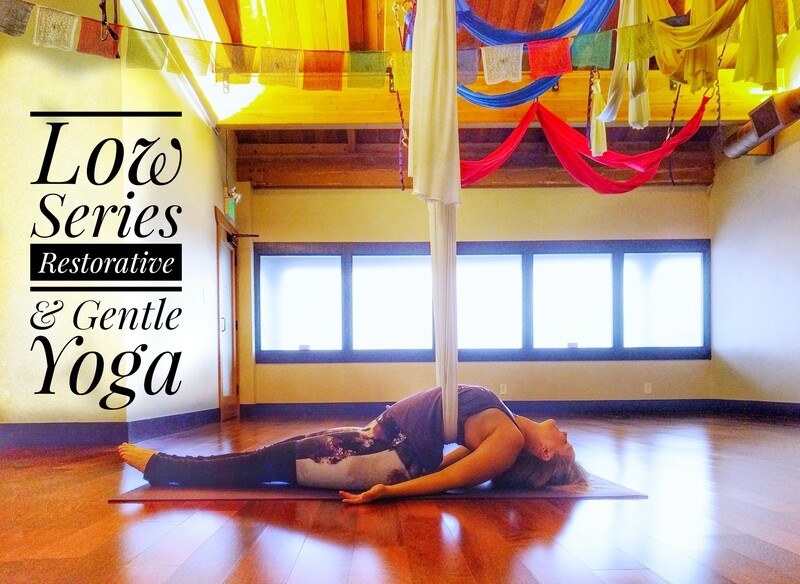 We'll be exploring shoudlerstand, headstand, forearmstand, and handstand in this series. Each week you will leave class knowing what components of your practice to work on so you progress by the next session. You'll leave this workshop with the tools to enter into inversions safely, explore the sensation of being upside down for longer periods, and build into variations on the inversions you gain comfort with. Series limited to 3 people. Reservations required. 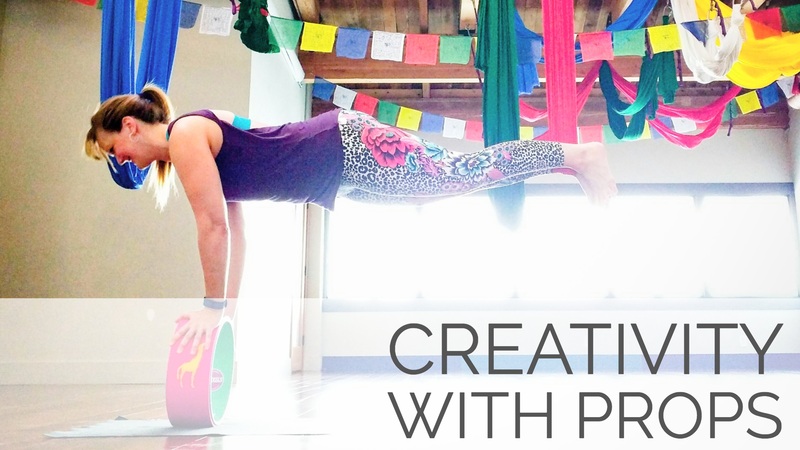 Props are more than a support; they can breathe new life into your yoga practice. In this immersion, we will look at a variety of ways props can enhance the practice, from support and assistance to challenging you, providing feedback on your alignment, opening up possibilities in asanas both familiar and new. 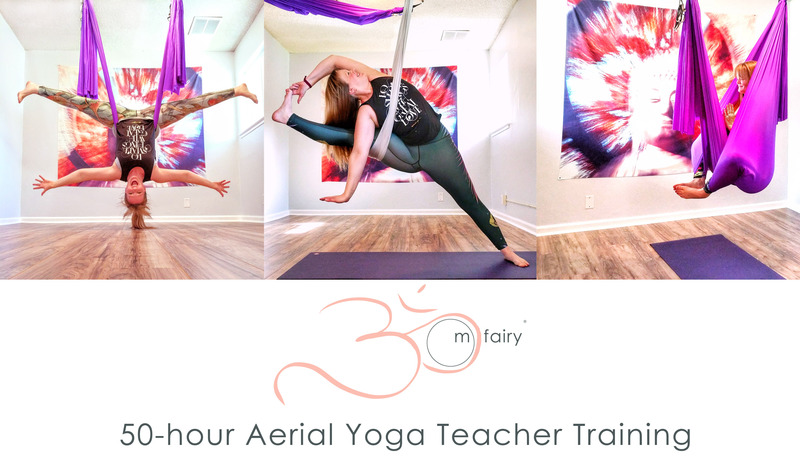 This course will cover the more traditional props found in the yoga studio, such as blankets, bolsters, blocks and straps, everyday props found in any setting, such as chairs, walls, desks, and more specialized props such as the yoga wheel, yoga egg, and the aerial yoga hammock. Over the course of this weekend as we explore the variety of props at our disposal, we'll discuss which props are better suited to different categories of asanas and purposes, and we’ll learn how to integrate props seamlessly and safely into our personal practice, into private sessions, and into larger classes. Despite the variety of options we will explore, the goal will always be a simple one - to deepen our awareness as we explore the sensations of the present moment. Whether you are a teacher or an avid student of yoga, this immersion will provide you with new ideas of how props can enhance your yoga practice. 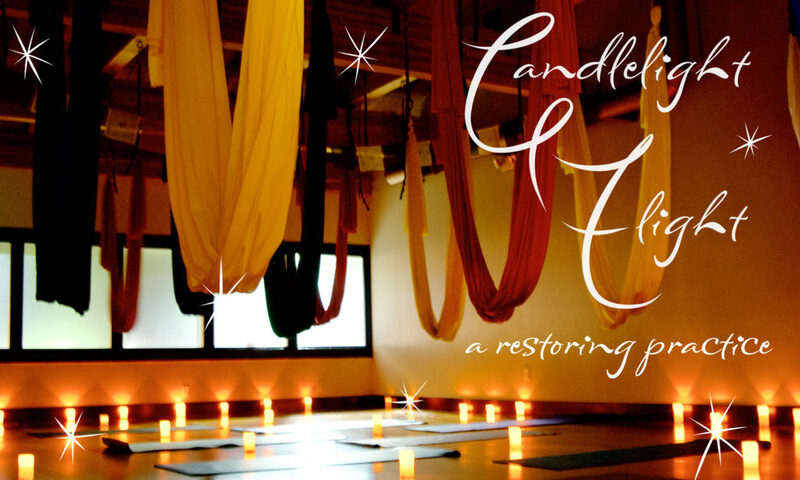 This workshop's hours count towards the Joy of Yoga™ 300-hour YTT program if you are enrolled. In this workshop we’ll start off with grounded, gentle stretches to shed the accumulated tensions from your day and week. Then we’ll move to the cocoon of the hammock, letting it provide a gentle embrace for the body in restorative postures as Courtney provides additional release for the body through a blend of thai massage techniques utilizing the hammock and hot stones to soften the body further. 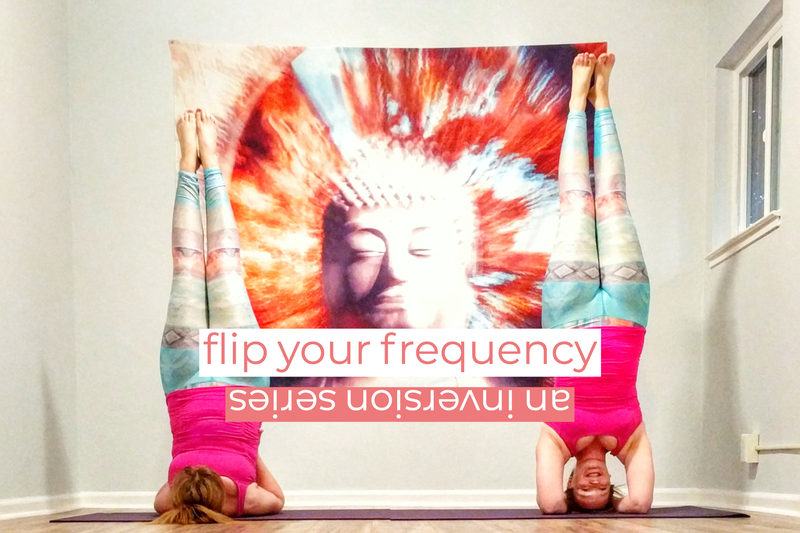 Finally, you’ll rest fully into a yoga nidra practice that moves through the energy centers of the body, enjoying the healing sounds of the 432 hz crystal lyre and Koshi chimes. 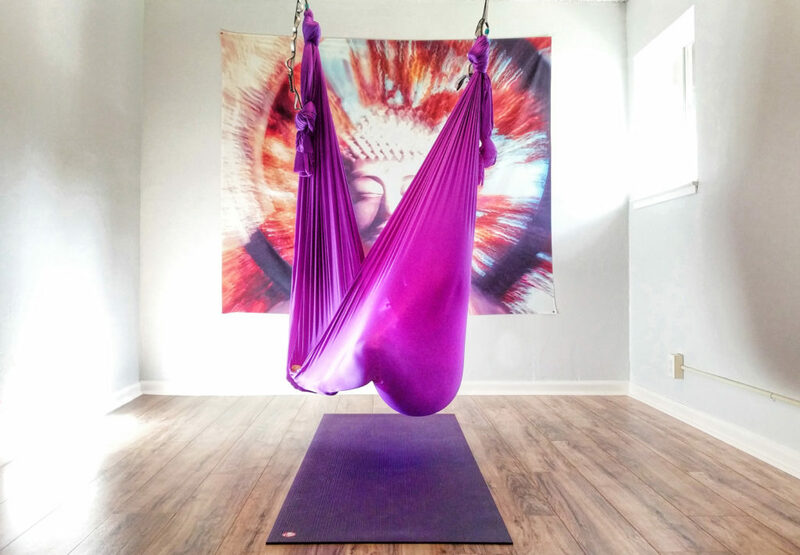 The aerial hammock provides new ways of discovering the core muscles as you lift, balance, and float the body through postures that at times feels very familiar to your mat practice and other times feels a world away as you hover above the earth. In this workshop we will explore how the hammock can provide support and assistance for many traditional asanas, helping you focus on utilizing the core muscles more so than relying on arm strength to support the body. You’ll find new ways to explore poses like side plank, crane, and handstand with the hammock providing different means of support, helping you hone your yoga practice in the swing or on the mat. 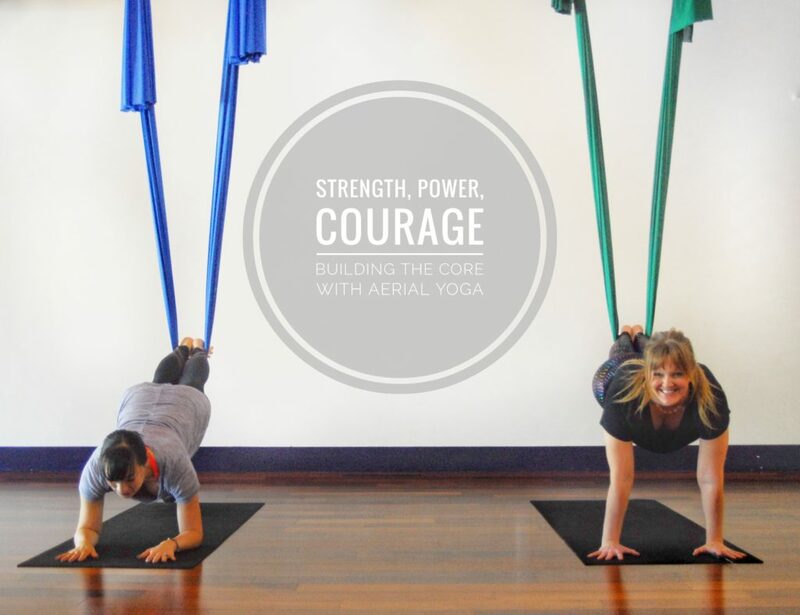 We’ll also lift off and take flight, discovering aerial-specific asanas such as Bird, Bat, and Stickbug, hovering your body above the earth with the power of your core, building courage and strength both in the swing and in the world. Mandala Tea House will be open as the workshop ends for 30 minutes, serving specially crafted beverages designed to calm the body and mind further. Vinyasa - a series of postures, one flowing seamlessly into the next, uniting mind, body, and breath. In this workshop we will explore our building block vinyasas to set the tone of moving in harmony with the aerial hammock. Then we will begin to play with a number of transitions that will open your mind to a number of creative ways you can get from point A to point B in the aerial hammocks. By the time you wind down your practice, you’ll be teeming with new ideas of how to get from standing to seated to wrapped to just hanging out and back again. In the low series we’ll take the hammock close to the ground, utilizing its pressure to gently coax open the body. The focus will be to move gently through the full range of motion in the body’s joints and spine, discovering the role of the breath in helping us release further. We will also explore a few strengthening asanas to enhance our body’s ability to come deeper into a restorative state so as we move into restful, restorative asanas, you are fully primed to sink deeper into the connection of your mind, body, and breath. 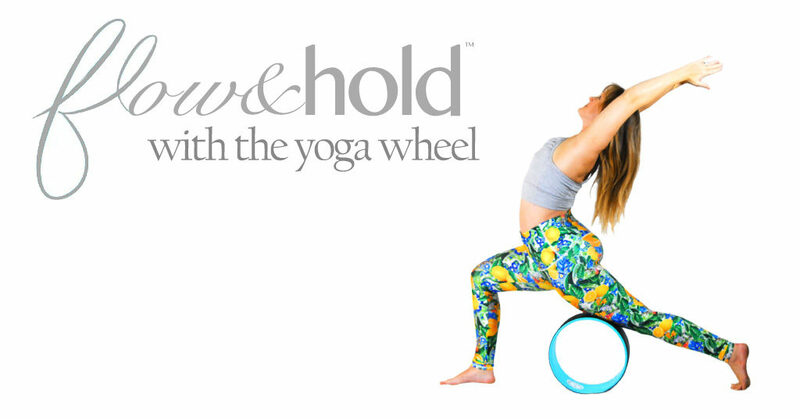 Whether you’ve only contemplated what to do with a yoga wheel or you’ve been using it as part of your practice a while, this workshop will help you discover new ways to use this fun & playful prop. After we center ourselves, this workshop will begin with a focus on how to flow with the wheel. We will explore transitions that can take you through a simple sun salutation with the wheel into flows with arm balances, inversions, and more grounded asanas. We’ll then discover how the yoga wheel can help us work deeper into some of our asanas as we hold the postures a little bit longer. From finding additional support with the wheel to deepening our experience of the body moving further into asanas, we’ll learn how to incorporate the wheel in all aspects of our yoga practice. Please note: We will explore inversions and prone postures that put pressure on the abdomen in this workshop. Due to this, I highly suggest eating early enough to let food digest by class time, more so than a typical yoga class. Friday, September 22 | 6 pm - 7:45 pm Breathe Together Yoga, Los Gatos, CA Join me for a relaxing journey in the silks with the addition of aromatherapy to enhance the meditative experience. The Candlelight Cocoon Meditation combined with specially selected essential oils will add another element to the transformative setting of the aerial silks! The Fall season offers us all a time to embrace the cool winds of change, which can create a shift in our living experience. Through the use of aromatherapy and a guided relaxation, we will explore the season’s effects and find a meditative mindset that helps to better connect to the subtle forces that stir change from within. 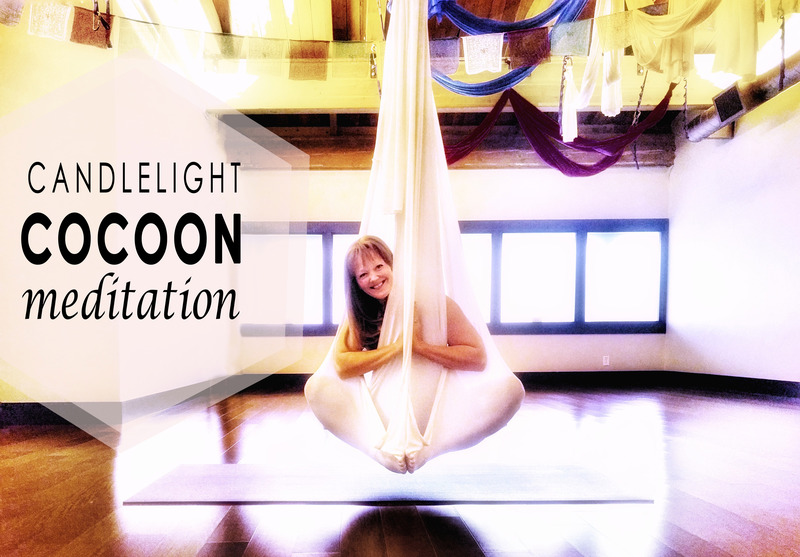 This special event will give you an enhanced experience of working between the “feel good setting of floating” in your cocoon and yet, provide depth for a grounding state of balance. The aerial hammock can do more than take you through an acrobatic workout. At its heart, it is a prop that can be used to enhance and further your yoga practice. 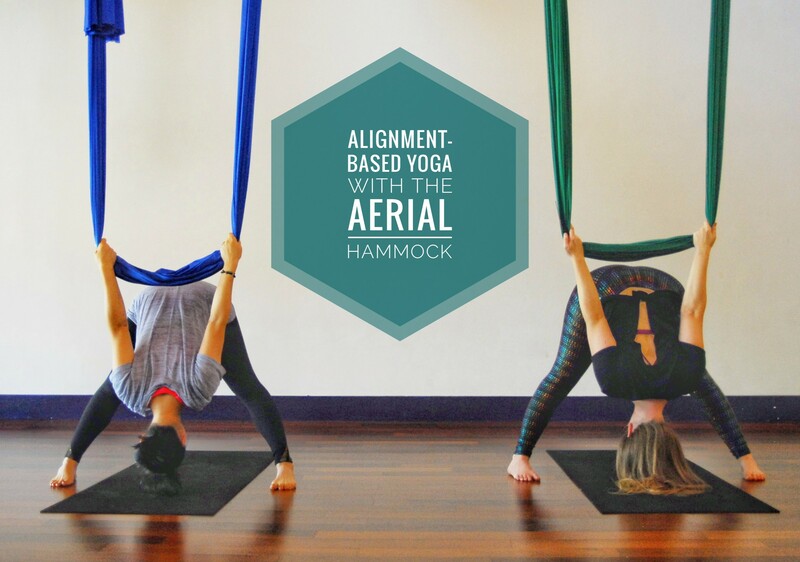 In this workshop, we’ll explore how the aerial hammock can provide assistance to help us feel familiar poses as we never have before, and we’ll carry these sensations back to the mat with us to see how it can change the mat practice. From utilizing the pressure of the fabric to help us release tension in our joints to discovering how the support of the fabric can help us explore asanas that we might not normally access, you’ll leave this workshop with new ideas to incorporate into your regular practice and maybe even find a new love for aerial yoga. Whether you are looking to inform your personal practice, move with safety into new asanas, or discover the deeper benefits of yoga, this workshop will help you identify ways to build and increase awareness in your practice. 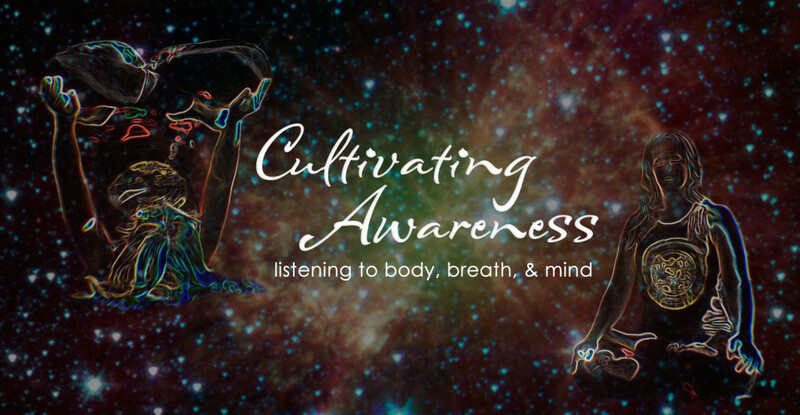 We will explore how our awareness shifts and how our body reacts as we move from flow to longer-held asanas to rest poses. Playing with changes in pace, exploring the sensations between gross and minute movements, and shifting breath patterns you’ll begin to discover how to let the body guide the practice and how to listen for the queues to develop steadiness and ease in your posture. By the time you leave you will have new tools to help develop and deepen your awareness, tapping into your body’s innate intelligence to guide your practice both on the mat and in your day-to-day life. Wondering what all the fuss is about with the yoga world’s newest prop? Whether you are trying to figure out if the wheel is useful or if you want to know what more can be done besides rolling around on it, come discover how this prop can provide support, strength, and even challenge in your practice. This workshop will look at how to challenge new muscles in familiar asanas, find new steadiness in balance poses, add support to your inversion practice, and even how to flow with the wheel. As we wind down, you’ll also learn to use the wheel for restoring and relaxing the body. By the end you will know how to do more than roll around and deepen your backbends, finding the yoga wheel an invaluable new tool for your practice. Please note: after a warm up we will move into working on inversions while we have the most strength, and we will explore poses that put pressure on the abdomen. Be sure to eat early enough to let your food digest before the workshop begins. In this workshop we'll start off with grounded, gentle stretches to shed the accumulated tensions from your day and week. Then we'll move to the cocoon of the hammock, letting it provide a gentle embrace for the body in a few restorative positions as Courtney provides additional release for the body through a blend of thai massage techniques utilizing the hammock and hot stones to soften the body further. Finally, you'll rest fully into a yoga nidra practice that moves through the energy centers of the body, enjoying the healing sounds of singing bowls and chimes. 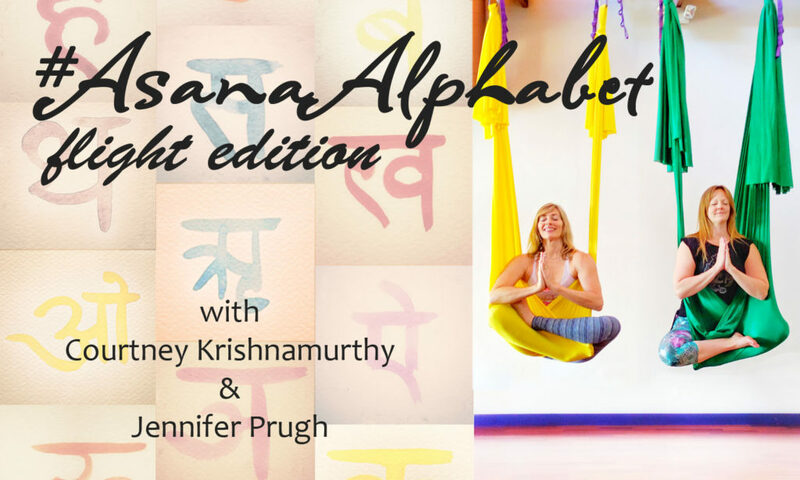 As we reach the end of the #AsanaAlphabet challenge, you may notice a lot of the ancient poses Jennifer Prugh posted over the past 20+ weeks had yogis performing some wild asanas. Indeed, the older texts seem to have a fascination with tapas, raising kundalini, levitation, and utilizing ropes as props. While these feats may seem out of reach for us modern-day yogis, many of the asanas we've seen can be mimicked or achieved with the help of our Flying Lotus hammocks. 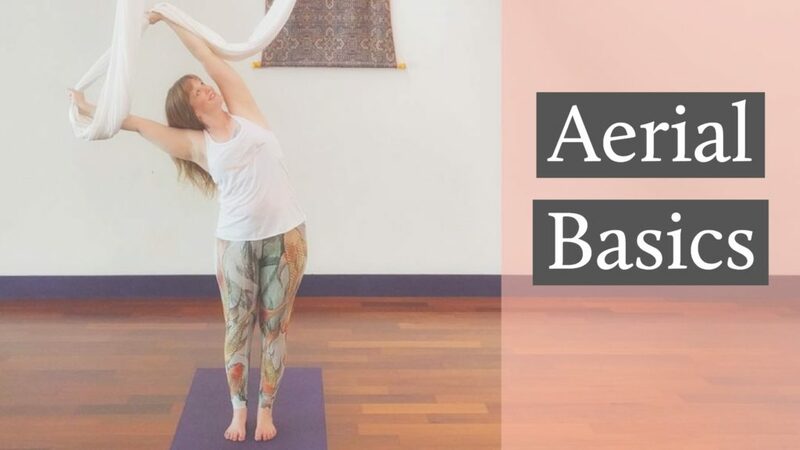 Join us for this light-hearted, playful practice where we'll explore ways to achieve some of these postures and their ends, assisted by the hammock. Whether we're successful in elevating our kundalini in tadan kriya or we feel the heat of tapakarasana (yes - hanging from our ankles! ), this class is certain to be slightly educational and full of levity and laughter.